Shortly after the outbreak of the First World War the First Contingent of the Canadian Expeditionary Force (CEF) sailed for Britain with a small supply of motorcycles, cars and trucks. Many of these were privately owned and had been impressed into military service by the owners’ Commanding Officer. 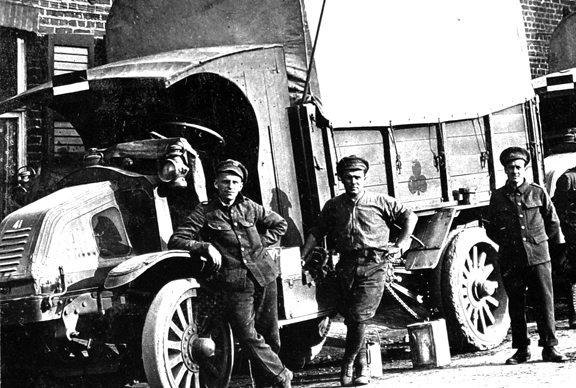 To support the Contingent the Department of Militia and Defence (M&D) made a small purchase of trucks to act as General Service Lorries and which were intended to follow the Canadian troops to France. The purchase was far from the War Establishment of an Infantry Division which called for 355 vehicles, used almost exclusively by the Ammunition Column and the Service Corps. With no domestic manufacturing capability headquarters found itself buying US-made vehicles. Ultimately, they bought vehicles from eight different suppliers. Worse, many of the trucks purchased were unsuited for their role and suffered early breakdowns while in England. Aggravating the situation was that spare parts for these trucks could only be obtained in the US. Once the War Office saw the state of the Division’s Mechanized Transport (MT) they undertook to replace the vehicles with those that met War Office (WO) specifications. 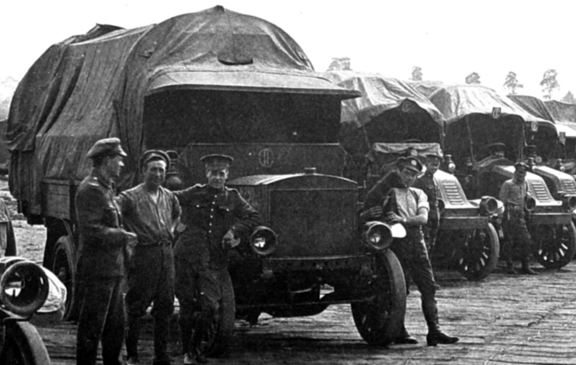 Even then, there were six different makes amongst the 51 trucks supplied by the British. 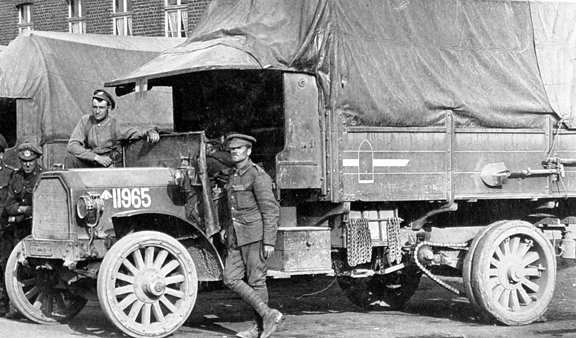 In keeping with the wishes of the War Office, the Canadians obtained additional trucks which met with British General Service (GS) specifications. 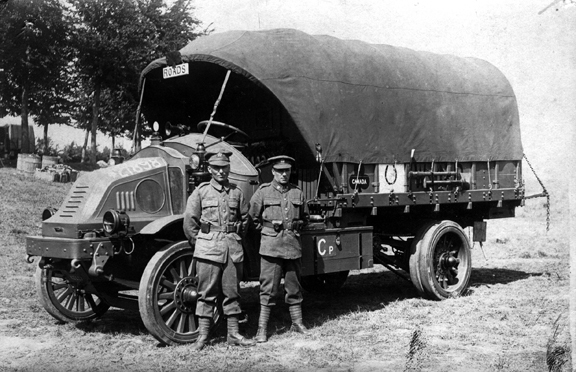 These were acquired by either purchasing the trucks from the British trade or, once in France, indenting for their needs to British Army headquarters. By the time the Armistice was signed, the CEF held in excess of 3,000 vehicles, most of which were transport lorries with a small sprinkling of cars, ambulances and motorcycles. 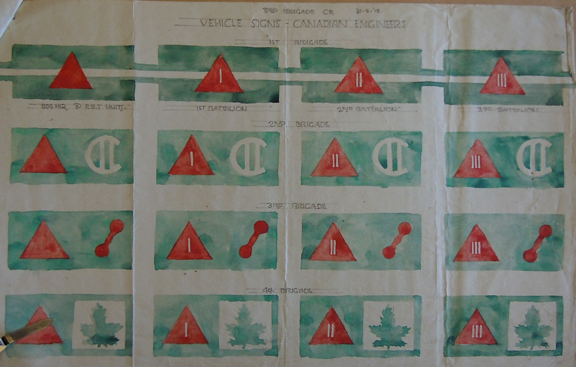 Late in the war the War Office determined that vehicles needed to be better identified for both ownership and purpose. 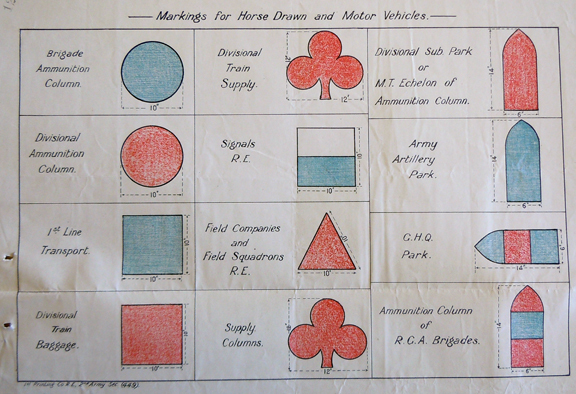 At the time horse-drawn equipment carried no marks and, with no established system from which to draw upon, the War Office put forth a scheme consisting primarily of graphics. 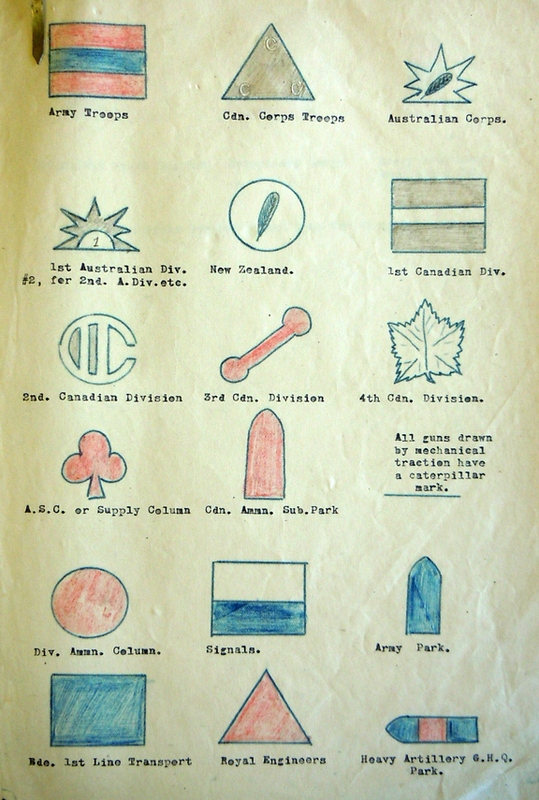 Some of these graphics were already in use as Army, Corps or Divisional marks while others had been put into use to identify the type and nature pf supplies headed to the front lines. Lastly, a graphic could be used in different colours or colour combinations. 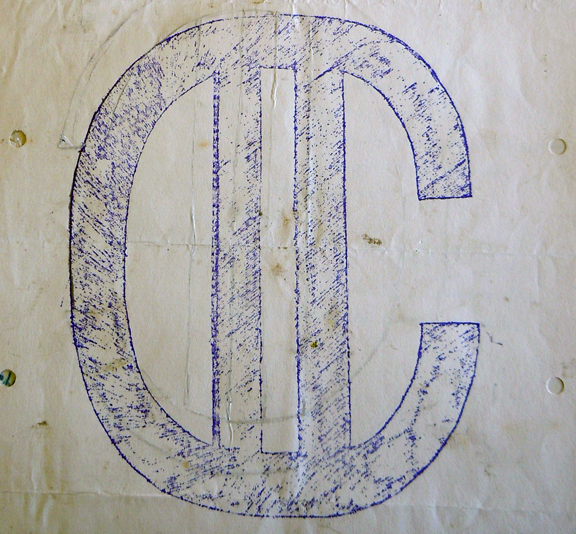 The use of these vehcile markings was also extended to horse-drawn equipment. With most of these vehicle marks coming into use in the last year of the war it is not surprising that few photos of these exist.